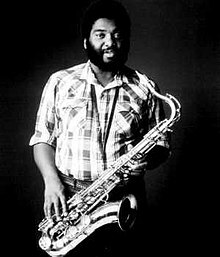 Cornelius Bumpus (May 7, 1945 – February 3, 2004) was an American woodwind, keyboard player and vocalist from Santa Cruz, California. Bumpus began his musical career playing alto saxophone at ten for his school band, and by age twelve he was playing at Luso-American dances. He attended Santa Cruz High School where he performed in the band and won the John Philip Sousa Award. He also played school dances with his own band, Corny and the Corvettes. In 1966 he was in Bobby Freeman's band and after that he began his association with many well-known groups. His role in these bands was primarily as a saxophonist. His most notable touring was with the Doobie Brothers and Steely Dan. Bumpus toured with Steely Dan from 1993 to 2003. In 2002, he worked on the Big Blue Earth project sponsored by the Church of Christ, Scientist. During the 1980s, Bumpus enjoyed a short tenure with Café Society, a Los Angeles pop band, in which he played in a horn section with the trombonist Dan Levine and trumpeter Anne Petereit King. In 1981, Bumpus issued his first solo LP, A Clear View, which featured his singing, writing and sax playing, stretching out with the band on several, long, jazzy jams over six minutes each. Bumpus died of a heart attack at age 58 on February 3, 2004 while on an airline flight from New York to California, where he was scheduled to perform at the Columbia College Jazz Concert Series. The plane made an emergency landing in Sioux City, Iowa, so he could get medical assistance, but Bumpus had died by the time the plane reached the ground. ^ "Cornelius Bumpus, 58; Musician With Doobie Brothers". Los Angeles Times. 5 February 2004. ^ "Cornelius Bumpus, 58, Rock Saxophonist". The New York Times. 5 February 2004. ^ "Cornelius Bumpus Obituary". The Scotsman. 3 February 2004. ^ "Doobie Brothers' Former Sax Player Dies at 58". Observer–Reporter. Associated Press. 5 February 2004.